Hikes that highlight the beauty of ice. Snow crunching underfoot, the couple followed the trail leading into Furth Wildlife Sanctuary in Surry. Their breath curled into clouds in the cold air, and as they walked, they talked, their words floating through the frozen forest. Now and then the two hikers stopped to pull off their mittens and photograph the beautiful scenery with their phones. In the peaceful forest, moss crept up the trunks of white cedars and peaked through patches of snow. Pools of ice, lined with concentric circles, filled dips in the terrain. And flashy clusters of lichen curled from trees and boulders. Balancing carefully over a narrow footbridge, the couple traveled deeper into the sanctuary to the edge of a rushing brook. A thin layer of ice lined its banks, an intricate pattern of frozen feathers, overlapping and reaching toward the swift-moving water. There the two walkers sat for just a few minutes, listening to the tinkle of the water and the distant drumming of a woodpecker. They breathed in the fresh air, held mittened hands and took a moment to enjoy the winter. Featuring about 2 miles of connecting footpaths, the Furth and Talalay sanctuaries are two rectangular parcels of forestland located beside each other in the small town of Surry. These sanctuaries are owned by the Blue Hill Heritage Trust, and their tall trees are home to many nesting migratory birds. Both sanctuaries feature a 1-mile loop trail, and these two loop trails are connected near the visitor parking area. The Talalay Nature Sanctuary loop trail travels through a mossy old-growth forest filled with towering white pines and hemlocks, old white and yellow birch trees, and stands of northern white cedars. And the Furth Wildlife Sanctuary’s loop trail visits evidence of a growing colony of beavers before winding through a mixed forest with beautiful brooks, which the trail crosses on wooden footbridges. Access is free, and dogs are not permitted. For more information, call the Blue Hill Heritage Trust at 207-374-5118 or visit bluehillheritagetrust.org. Directions: The parking lot for both Furth and Talalay sanctuaries is located on Cross Road in Surry. To get there from downtown Ellsworth, take Route 172-W Main Street toward Blue Hill and drive for 6.5 miles, then turn left onto Route 176-Morgan Bay Road. Drive 2.7 miles, then turn left onto Cross Road. Drive 0.6 mile and turn right into the parking area, which is also used by visitors to the Carter Nature Preserve. This 3-mile long hiking trail travels through a lovely mixed forest along the banks of St. George River to visit what remains of the historic Georges River Canal, which dates back to the late 1700s. Along the way, interpretive displays describe aspects of the canal system that are still visible today. This trail is one of several trails that make up the 50-mile Georges Highland Path, a network of low-impact footpaths in the midcoast region built and maintained by the Georges River Land Trust. Marked with blue blazes, the trail weaves through tall evergreens and beds of ferns, never traveling far from the banks of St. George River. 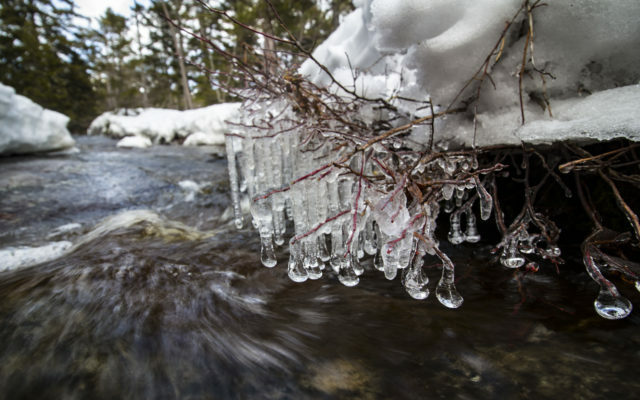 In fact, several sections of the trail travel right along the edge of the rushing water, which freezes into fascinating ice formations along the banks in the wintertime. Access is free, and dogs are permitted if on leash. For more information, visit www.georgesriver.org or call the Georges River Land Trust at 207-594-5166. Directions: The north trailhead is located by Robbins Lumber. From the Fraternity Village Store in Searsmont, near the intersection of Route 131 and Route 173, head south on 131 for 1.7 miles to Ghent Road on the left. Travel 0.25 mile on Ghent Road to the parking area on the right, just after crossing the bridge. You will need to walk back over the bridge on foot to reach the trailhead, which is marked with a kiosk. The south trailhead is located at the Appleton Preserve parking area. From the intersection of Route 17 and Route 131 in Union, travel north on Route 131 for 7.8 miles. Turn right onto Route 105, and the parking area is in 0.4 mile on the right. With a long, granite ridge that tops off at 2,214 feet above sea level, Rumford Whitecap Mountain offers a moderately challenging day hike to panoramic views of the mountainous wilderness of western Maine and New Hampshire. Starting out in a quiet mixed forest, the 5-mile out-and-back hike is a fairly continuous climb, crossing several tumbling brooks on the way to the mountain’s open summit. During the winter, the water continues to flow off the mountain, forming icicles and frozen foam along the way, so be sure to wear waterproof boots and bring your camera. Much of the mountain is located on Mahoosuc Land Trust’s 752-acre Rumford White Cap Mountain Preserve, where two blazed hiking trails lead to its top. Along the way, keep an eye out for a wide variety of tree species, including large white and yellow birch trees, stands of striped maple, tall hemlocks and red pines. In fact, the mountain is home to what’s thought to be the largest red pine woodland in the state, covering 210 acres. Access is free, and dogs are permitted if kept under control at all times. For more information, visit mahoosuc.org or call the Mahoosuc Land Trust at 207-824-3806. Directions: From the bridge over Swift River spanning from the town of Mexico to the town of Rumford, drive to Rumford (west) on Route 2-Lincoln Avenue 0.2 mile, then turn left onto Route 2-Hancock Street. Drive 0.4 mile, then turn right onto Route 2-Rumford Avenue. Drive 0.5 mile on Rumford Avenue, which becomes Franklin Street along the way, then turn right onto Route 2-Bridge Street. Drive 5.6 mile to Rumford Center, where you turn right onto Andover Road. Drive 4.5 mile, then turn right onto East Andover Road. Drive about 0.2 mile and the gravel parking lot for the preserve is on the left. The parking lot is plowed year round. You’ll see on a trail map posted on a kiosk at the parking area that two trails lead up the mountain. Both trails start across East Andover Road from the parking area, on either side of the brook.